The company will be returning to home ground at the Resistance Gallery in Bethnal Green, London. The first bout sees EVE Champion Charlie Morgan defending her belt. The reigning Champion captured the title at Wrestle Queendom. 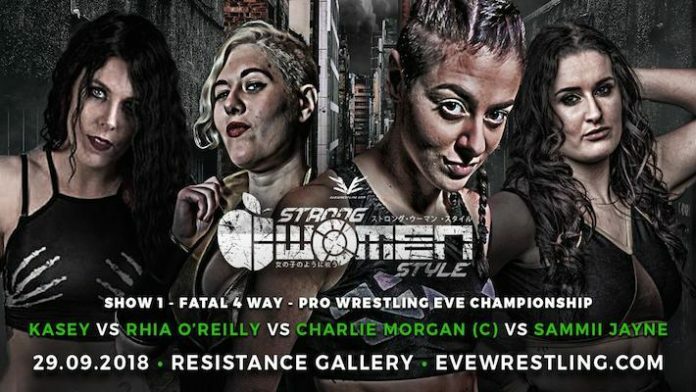 Morgan will defend the belt in a company first history making Fatal Four Way match. The other combatants are Kasey, Rhia O’Reilly and Sammii Jayne. The second bout sees WoS Women’s Champion Kay Lee Ray taking on Laura Di Matteo. This is a first time ever bout between two of the UK’s most underrated stars. Pro Wrestling: EVE is becoming one of the biggest underground prospects in pro wrestling. The company has amassed a diverse fan-base outside of the ‘wrestling crowd’ by becoming one of the hottest attractions in London. Several of the company’s stars have appeared on mainstream UK television on WoS, ITV’s morning programming and BBC Documentaries. News outlets across the globe have featured EVE in the past year including New York Times, The Mirror, The Independent and The Metro. Check out EVE’s on demand library here. You can sign up now for a free 7 day trial and check out their recent events such as Slayers in Spandex, Nasty Women and RIOT GRRRLS.